First release of November! You wanted more backup options? You got it! Please also consider to check our new documentation. With the "production" DR tag, we'll stream 3 VMs (XOA Free, Starter and Enterprise) to our pool named lab3, with a retention (depth) of 3. All of this, every hour. Now, all your selected VMs will be copied (running or not!) to this pool/host, even with a dedicated tag indicating that's a DR VM. That's it. Congrats, your VM is booting and running fine. no more import time on a host after a catastrophic event: the VM is ready to start! You want more again? E.g, stream a VM to multiple hosts? If you have a multi-site installation? 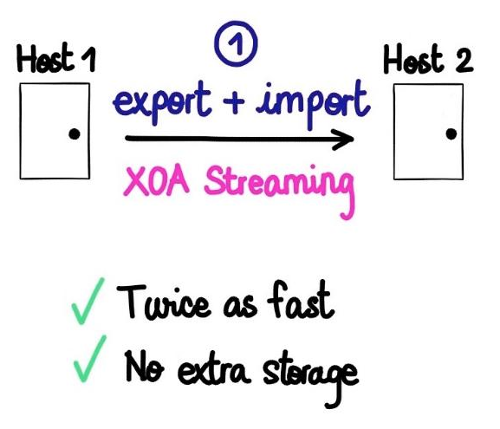 That would be possible very soon, and by doing it smartly: only export once on the "origin" host, then stream it to all destinations at once. Okay but what about copying the VMs on this DR host to a brand new production host? Read the following paragraph! This copy works for both halter or running VMs. Copy is not Xen Storage motion: we do not move the VM. This will automatically import the XVA to your selected host. By default, all scheduled backups are using compression. It saves space (and bandwidth if your NFS server is not on a fast link), but it could be long due to CPU needed to compress. By adding this option, you could now make your backups without compression and accelerate the process. Take a look on our previous blog post talking about the choice to compress or not your XenServer backups and exports. Thanks to the huge work done in logs, we'll implement reports by emails when backup is done with some stats, alert thresholds etc.